Elected Queen of Naboo at a young age, Padmé Amidala Naberrie has defined herself by that identity, having saved her planet from the predations of the Trade Federation, and restored peace with the Gungans who inhabit Naboo’s waters. Now her term as Queen is up, and Padmé will have to discover who she is without politics. But duty will knock again, this time when her successor asks her if she will represent Naboo in the Galactic Senate. Being a Senator of the Republic is quite different from ruling a single planet, and Padmé will find herself in deep politics waters as she struggles to step out from under the shadow of the throne, and into her new role. Queen’s Shadow covers a portion of the time between the events of The Phantom Menace and Attack of the Clones. It opens on the handmaiden Sabé—played by Keira Knightley in the film—performing the decoy maneuver during the crucial events of the Battle of Naboo. However, the main body of the action takes place during the year or so after Padmé leaves Naboo for Coruscant, where old enemies and new rivals await the young Queen-turned-Senator. Balancing a galaxy is much more difficult than running a planet, with many established factions already in play. Padmé’s reputation as Queen Amidala precedes her, and no one in the Senate has forgotten that she upended tradition and unseated Chancellor Valorum to save her own planet, catapulting Naboo’s former Senator, Palpatine, into the Chancellor’s office. Anakin Skywalker has little role to play in Queen’s Shadow, and though he is referenced, I do not believe he was ever actually named. Rather, Padmé’s primary relationship in Queen’s Shadow is with her handmaidens, and with Sabé in particular. It is a delicate balance of friend, colleague, and queen, filled with mutual respect, but profoundly imbalanced by duty and loyalty: “Padmé knew in her heart that Sabé would do whatever she asked, even if it meant Sabé’s life, and therefore she was always careful never to ask too much.” The perspectives of the handmaidens are as important as Padmé’s to Queen’s Shadow; they too are in a time of transition, figuring out whether they will stay or go, and how they will serve their former Queen in her new capacity as Senator. Sabé’s plotline follows her to Tatooine, where Padmé hopes to quietly use her money to free slaves, though abolition proves to be tricky work. 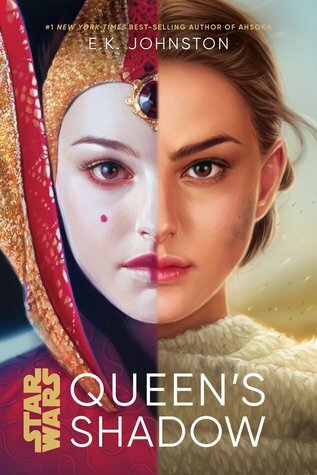 Queen’s Shadow is a Star Wars novel written by someone who clearly shares a love for Padmé’s character, and perhaps even a belief in her unfulfilled potential within the films. E. K. Johnston even slips a sly line of dialogue into the epilogue, set after Padmé’s funeral, in which Sabé vents the disbelief of many a fan: “It doesn’t make any sense!….She wouldn’t just die.” I should note here that I am quoting from an ARC, and I sincerely hope this line makes it to final publication! It was such a pleasure to read about a smart and brave woman surrounded by other talented, dedicated women prepared to give their lives to the Republic. Padmé’s canonical fate is not going away, but there is much more to her before that ending. At the end of January, I had the chance to attend two days of the American Library Association’s Midwinter conference in Seattle. I had a great time attending panels, meeting up with book blog and librarian friends, and browsing the exhibits. As usual, publishers were spotlighting some of their upcoming titles. Here are a few that I am excited about! If you love a Pride and Prejudice retelling as much as I do, you will be equally excited to check out Unmarrigeable, a modern day, Pakistani revisitation of Jane Austen’s classic. Alys, the second of five daughters, teaches English literature at a girl’s school, to pupils who often drop out to marry and start having children. Literature is her small chance to influence them before they begin that chapter of their lives. Her small town is set atwitter by a big wedding, which brings several eligible bachelors, including the wealthy entrepreneur Mr. Bingla, and his aloof friend, Mr. Darsee. I didn’t want to leave you only with titles that aren’t out yet, so this one is already available from Ballantine Books! I knew that the publisher was going to be promoting Dhonielle Clayton’s follow up to The Belles at ALA, but I figured that it would be so popular I would probably miss out. So I was surprised but pleased to pick up an advance copy of The Everlasting Rose, which will follow Camille, Edel, and Remy as they try to save the rightful heir to the throne before her evil sister, Princess Sophia, can cement her rule of Orleans. To succeed, they will need to join forces with the Iron Ladies, a group of women that totally reject the beauty treatments that Orleans society is built upon. The revolution is here. Coming March 5, 2019 from Freeform. When Padmé Naberrie completes her term as Queen of Naboo, she faces the daunting task of building a new life for herself, out from under the long shadow of the throne. Instead, she will find herself in deep political waters, when her successor asks her to serve as Naboo’s representative in the Galactic Senate. Despite her uncertainty, Padmé agrees to her Queen’s request, and takes up the challenge. To be honest, that cover alone was enough to pull me in, but I am excited to see E. K. Johnston, author Exit, Pursued by a Bear, take us on Padmé’s journey from Queen to Senator. Coming March 5, 2019 from Disney Lucasfilm Press. One of the great benefits of going to ALA is getting to talk to the publicists, and find out what they are hyped about. When asked which fiction title she was excited for, one of the Harper reps said “this one!” with such speed and certainty, that I took it without further question. The Confessions of Frannie Langton follows the trial of a former Jamaica sugar plantation slave accused of murdering the man who enslaved her, and his wife. Frannie herself claims to remember nothing about the night of their deaths. The novel is already garnering comparisons to the work of Esi Edugyan and Colson Whitehead. It is set to hit shelves on May 21, 2019. Juliet Palante has just come home to the Bronx from her first year at college, and she is trying to figure out how to come out to her Puerto Rican family before she moves across the country for a summer internship. She will be spending the summer working for Harlowe Brisbane, author of Raging Flower, the book that sparked Juliet’s feminist awakening. But when she arrives in Portland, Juliet quickly feels out of her depth. The longer she is in Portland, the less sure Juliet is about Harlowe’s brand of feminism. But the summer nevertheless introduces her to people and experiences that will open her mind in ways she never expected. Originally published by Riverdale Avenue Books in 2016, I noted at the time I reviewed it that the book could have used another editorial pass, and a little more polish and attention. So I am excited to see that Patrice Caldwell at Hyperion has picked it up for re-release in the fall of 2019! I can’t wait to see this book get another chance to shine. Look for it September 10, 2019. Did you have a chance to attend ALA? What forthcoming titles are you excited about? Let me know in the comments!